I know I haven't posted for about 12 months but I have been making some quilts. And Amy is having another quilt festival thanks Amy for letting me join in. This quilt I made with some help from my fellow workers. 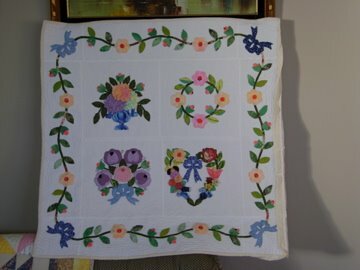 They made the heart blocks at each end of the quilt. We have given it to a friends daughter. She has been unwell and we hope this will be a comfort for her. I had fun quilting this quilt and trying out different quilting patterns. I used cotton batting instead of the usual polyester. I know it is a bit more expensive but if that is the reason for the better quilting finish it is worth using. Very nicely done. Love your quilting. Congrats! Your quilt looks lovely. It is wonderful when people work together on a quilt. A lovely gift.